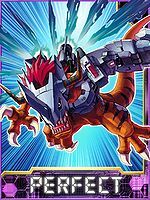 Difference between revisions of "Metal Greymon X-Antibody"
Evolves from [[Death-X-DORUgamon]] (1.5 Only), [[Greymon X-Antibody]], or [[Raptordramon]] (1.0 only). Can evolve to [[Giga Seadramon]], [[Grandis Kuwagamon]], or [[War Greymon X-Antibody]] (1.0 Only). 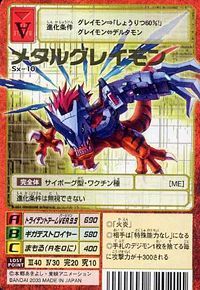 Metal Greymon X-Antibody evolves from [[Death-X-DORUgamon]] (1.5 Only), [[Greymon X-Antibody]], or [[Raptordramon]] (1.0 only), can evolve to [[Giga Seadramon]], [[Grandis Kuwagamon]], or [[War Greymon X-Antibody]] (1.0 Only). Evolves from [[Coelamon]], [[Greymon X-Antibody]], or [[Revolmon]]. Can evolve to [[Metal Etemon]] or [[War Greymon X-Antibody]], and can Jogress with [[Loader Liomon]] to evolve to [[Bantyo Liomon]]. 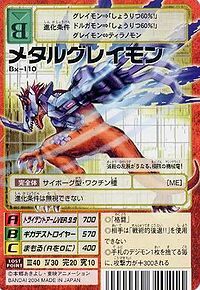 Metal Greymon X-Antibody evolves from [[Coelamon]], [[Greymon X-Antibody]], or [[Revolmon]], can evolve to [[Metal Etemon]] or [[War Greymon X-Antibody]], and can Jogress with [[Loader Liomon]] to evolve to [[Bantyo Liomon]]. A Cyborg Digimon which has mechanized more than half of its body. The Metal Greymon of File Island were able to drastically extend their vital functions through remodeling, but their flesh portions could not hold out and were discolored blue. 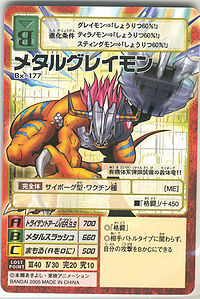 However, perfect Metal Greymon are Cyborg Digimon that succeed in evolving from Greymon, and draw out a stronger power. In order to evolve to Metal Greymon, it must fight its way through and defeat the formidable opponents who come against it. 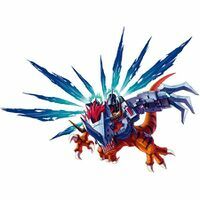 Also, Metal Greymon's offensive power is said to equal that of a single nuclear warhead, and if the likes of a low-level Digimon suffered that blow, it would be annihilated without leaving a trace. Its Special Moves are its "Trident Arm" made from enhanced Chrome Digizoid, and firing its "Giga Destroyer" organic missiles from the hatch on its chest. 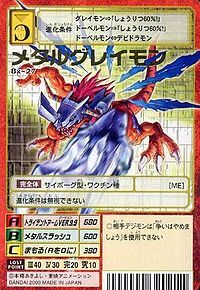 Sorry, but Metal Greymon X-Antibody's profile hasn't been translated yet. n., An object made of metal; Referring to the Chrome Digizoid metal alloy used for his cybernetics. 1) adj., Possible misspelling & shortening(?) of great 「グレイト Gureito」. 2) v.intr., Possible misspelling of gray; meaning old or ancient. Anime/Manga D-Cyber: "The Nightmare Trip to the Digital World!" Swings its Trident Arm with the destructive energy of Giga Destroyer. Giga Destroyer  ギガデストロイヤー Giga Desutoroiyā Giga Blaster Launches organic missiles from the hatch on its chest. Slashes the enemy with its Trident Arm. Metal Greymon X-Antibody is the partner of Raku Teru. 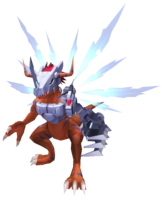 Metal Greymon X-Antibody evolves from Death-X-DORUgamon (1.5 Only), Greymon X-Antibody, or Raptordramon (1.0 only), can evolve to Giga Seadramon, Grandis Kuwagamon, or War Greymon X-Antibody (1.0 Only). Metal Greymon X-Antibody evolves from Coelamon, Greymon X-Antibody, or Revolmon, can evolve to Metal Etemon or War Greymon X-Antibody, and can Jogress with Loader Liomon to evolve to Bantyo Liomon. A machinesaurus of the utmost limits, whose left arm of annihilation howls! This cyborg dragon is equipped with organic-type warheads!! ↑ D-Cyber: "Chapter of Courage"